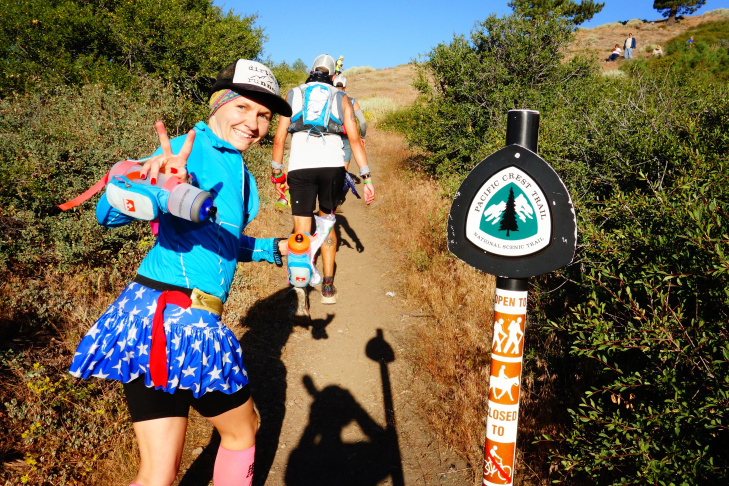 Ultrarunner Martine Sesma is in good spirits as she passes through the Inspiration Point aid station of the Angeles Crest 100 ultramarathon on the Pacific Crest Trail. 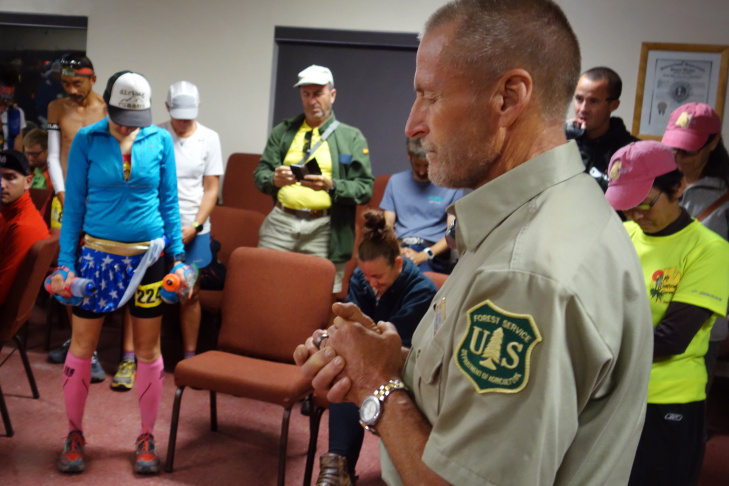 In the minutes before the Angeles Crest 100 ultramarathon gets underway in Wrightwood, Martine Sesma, in blue, bows her head as U.S. Forest Service volunteer Gary Hilliard gives the invocation. Ultrarunner Martine Sesma uses a small handheld breast pump at about mile 26 of a 100-mile trail race from Wrightwood to Altadena. The mother of two boys, ages 2 and 6, she has been breastfeeding since before she began running. She discards the milk and rinses the pump so that it's ready in a few hours at her next aid station. Ultrarunner Martine Sesma runs into an Angeles Crest 100 aid station after completing nine miles of the 100-mile race from Wrightwood to Altadena. 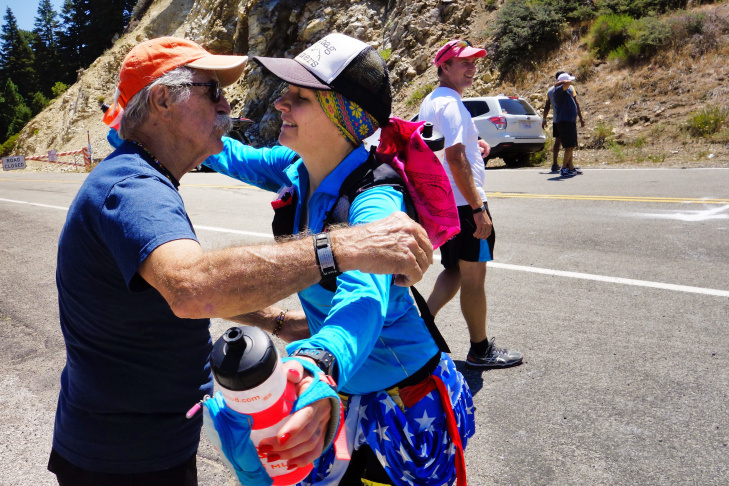 Longtime trail runner and race director Steve Harvey greets Martine Sesma as she completes the 26th mile of the Angeles Crest 100. 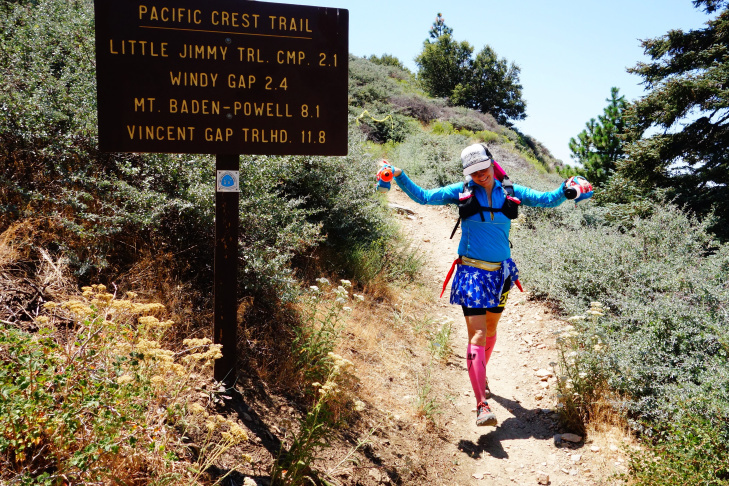 Ultrarunner Martine Sesma descends the Pacific Crest Trail as she completes mile 26 of a 100-mile footrace, the Angeles Crest 100. Martine Sesma stood out from the crowd of 178 runners gathered early Saturday at the start of the 30th running of the Angeles Crest 100. 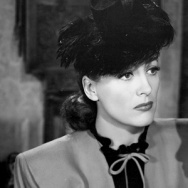 Her Wonder Woman skirt – shiny gold stars on a field of blue – was hiked up just enough in front to show her race number, 224, pinned to one leg of her shorts. Despite the superhero garb, she was there for vindication after last year’s race when she had the all-too-human experience of dropping out midway. The AC 100 is an unforgiving course that takes runners from Wrightwood over rugged but spectacular trails in the San Gabriel Mountains to a park in Altadena 100 miles away. All told, participants face 22,000 feet of total elevation gain. The race got underway at 5 a.m. Cheers diminished to excited chatter among the runners as the race veered straight uphill. It was dark and a little bit cold. The air was thin due to the altitude. That climb was 2,000 feet, the first of many steep ascents and tricky downhills. The athletes knew that as the field stretches out, they would spend much of the next 19 to 33 hours on the trail running, hiking and powerwalking in near solitude, with perhaps only one or two runners in sight. Most were already walking, just a few hundred yards into the race, conserving their energy for the difficult terrain ahead. This was Sesma’s second attempt to complete this notoriously difficult race. She purposely kept an easy pace to stave off the exhaustion, injuries and pain that caused her to drop out last year. Sesma’s journey to this year's AC 100 started six years ago when she ran one mile at a girlfriend’s suggestion. It was just a few months after her oldest son was born. And it was exhausting. Sesma found the painful joy of running helped her deal with the lingering effects of some painful episodes in her life. Less than a year after that first mile, Sesma finished the 26.2 miles of the 2012 Long Beach Marathon. She flopped down on the grass and told her friends she wanted more. More miles, more of that feeling. A few months later, she ran her first ultramarathon. “When I start feeling the kind of fog and density of the depression, I know that if I run 30 miles, my brain is going to get back on track,” she said. An ultramarathon is any race longer than a standard marathon. 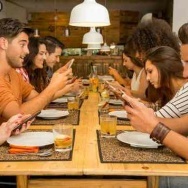 The hundred-mile distance is growing in popularity. Snagging a spot in the venerable Angeles Crest 100 is in such high demand, would-be participants enter a lottery, and if chosen, validate it by doing volunteer trail maintenance work. 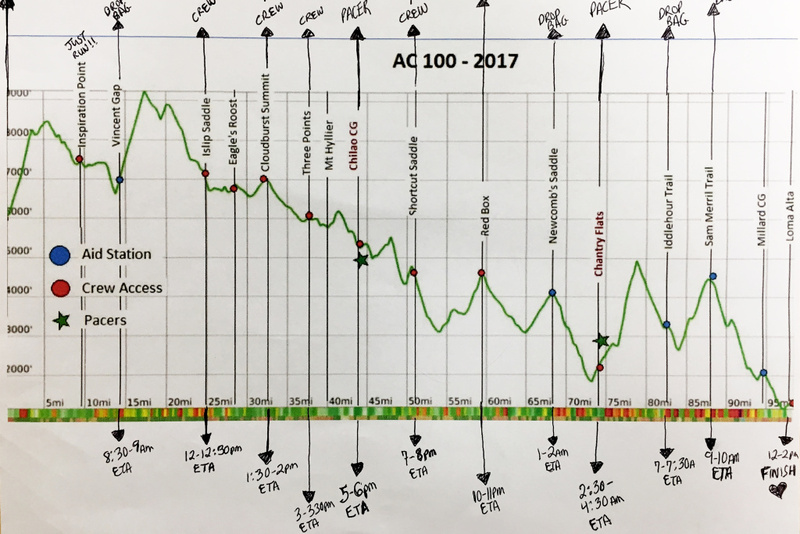 Ultrarunner Martine Sesma plots out her expected arrival at aid stations along the 100-mile route of the Angeles Crest 100 trail race. Since that first marathon, Sesma has completed one 100-mile race and racked up more than 100 miles in a multi-day race, winning her division. Her sons, ages 2 and 6, often come out to races and occasionally accompany her on training runs. The older son, Orion, can run a few miles with her, and Sesma carried her younger son Sagan (nickname: Trail Baby) on her back in a sling during training runs. The next step was to go for an Angeles Crest finish. 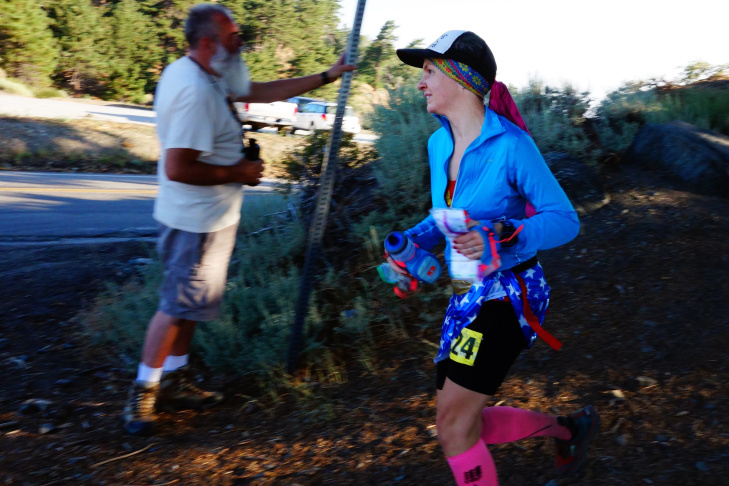 As she passed through the mile 9 aid station at Inspiration Point along the Pacific Crest Trail, Sesma described the best sight of the morning. “The sun was red coming up over Acorn. I love a red sky in the morning, it’s very dramatic,” she said. Sesma has been breastfeeding since before she started running. She pumps at every race to keep her milk ducts clear. The milk would spoil if she tried to save it, so she threw it out and rinsed the pump so it could be ready a few hours down the road. While she used the small portable hand pump, her crew members emptied the rocks out of her shoes; they handed her packets of sports drink powder. She carried avocados and potato chips and other real foods to keep up her energy on the run. She had 74 miles more to go. She was determined to finish, but had some health issues to manage. She sprained her ankle at mile 6 and had stomach issues since mile 13. She worried that the symptoms of endometriosis that knocked her out of last year’s race might be back. Ultrarunners learn to handle discomfort and pain, but this was something else. “What really did me in was the hallucinations,” Sesma said. Runner Martine Sesma sits alongside the trail course at about mile 51 of the Angeles Crest 100 trying to gather the strength to continue the run. Runners had until 2 Sunday afternoon to reach the finish line at Alta Loma Park in Altadena where each was greeted by cheers, cowbells and applause from family, crew members and runners who had already finished. But that welcome was not for Martine Sesma. The stomach pain she had felt at mile 13 was accompanied by uterine bleeding, she said. 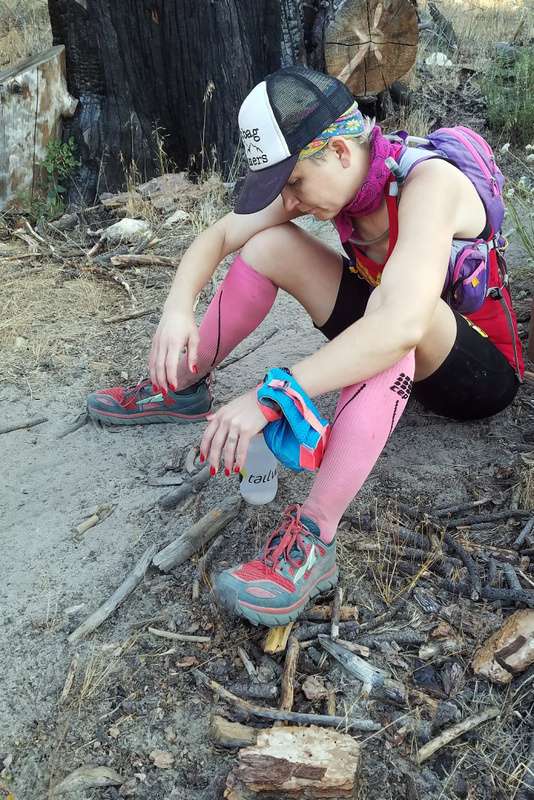 She couldn’t take in enough calories and she collapsed alongside the trail outside an aid station. When she was late arriving at the station, her crew ran out to find her. They brought her to the aid station and fed her rice to restore her nutritional balance, but by then, so much time had passed she missed one of the cutoffs to continue on. Her race was over at mile 51. This is the very essence of ultrarunning. 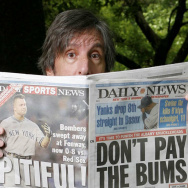 You go, you try, and often, you drop. More than one-third of the Angeles Crest starters did not finish. But you also learn what it takes to keep going. “My takeaway is that my body is just not capable of doing this particular 100 mile race yet but that I'm going to give myself a few years and then try again,” Sesma said.